And finally, this album from Gretchen, of GHBooks, is the last of our swap books for this round. 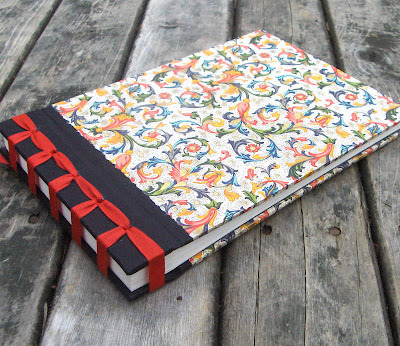 This is a stab bound album covered with a traditional Italian (Florentine) paper. Gretchen says that this paper has been traditionally used as endpapers but that the vibrant colours and gold highlights are too beautiful to be hidden inside the book! This album has 20 pages of nice Stonehenge paper with a natural deckle edge. 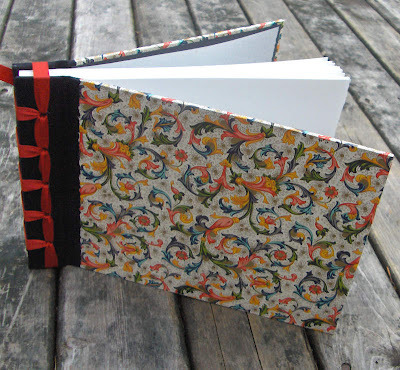 You can see similar albums and other books made by Gretchen at GHBooks.Etsy.com.